Beck returns home to a rural town after he left his job, deciding to take care of his grandmother's home for a few months while he looked for another job. Cal grew up in the farm adjacent. As childhood friends, Beck and Cal didn't get along as teens. Cal athletic from farming, Beck artistic and out & proud. Beck felt Cal bullied him, pushing him away, not realizing it was because Cal had a crush on him. Years later, after a lifetime of growth, the men are next door neighbors in a town where if you think it, it's already spreading down the gossip chain. Cal is terrified to lose the family farm due to being gay. He's out and not proud – it's okay to be gay as long as he never dates. Beck just quit a job due to bigotry, so this adds fuel to Cal's fire. The book was a quick, sweet read. Perfect way to spend the afternoon reading, without too much angst or conflict, but obviously miscommunication. Living in a small town myself, I know things aren't as 'dramatic' as portrayed. There is a soap-opera, dramatized-for-TV small town mentality, which while okay for fiction, is not at all the mindset in small-town USA 2017. Little bit over-the-top, but suspending belief added on top of the fact that this is warm and fuzzy romance, had me overlooking this. 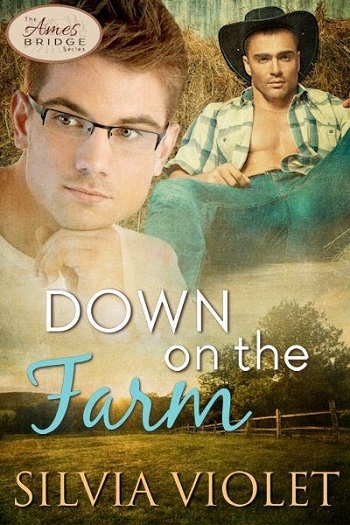 Reviewers on the Wicked Reads Review Team were provided a free copy of Down on the Farm (Ames Bridge #1) by Silvia Violet to read and review for this tour.